The Manot Music and Arts Festival, being held at the Village de Vacances, Manot (16500) on 20 June, is now less than two weeks away. Preparations are fast becoming a reality and the list of things to do is slowly getting less and less! The activities available are the only area that hasn’t yet been covered by a blog, so here is a little bit more information. Julie Mason will be working hard painting the faces of anyone who wants to get involved. 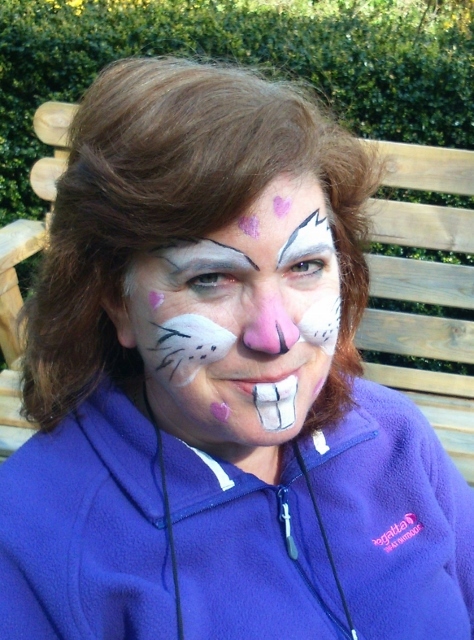 Despite popular belief, face painting is not just for the children! Sheila Portman will also be available to do a single braid, so whether you’re an adult or a child, you can get a braid and have your face painted. Both will charge a small fee but a festival wouldn’t be festival without having something quirky to offer! Manot Poterie is also known locally as the Ceramic Café. Dee and Michael Bayly run this lovely little studio and café in the village of Manot. They will be bringing a few examples of finished pieces to show at the festival, so you will be able to see what is possible in their studio, and how easy it is to achieve a great looking item. As all of their pottery items require firing in a kiln, this is impossible to achieve at the festival, so Dee and Michael will be bringing along fridge magnets that children and adults alike can paint on the day. The medium they will use will not need to be fired in a kiln, so you will be able to create your own design, have it fixed there and then, and take your masterpiece home with you. If you get Etcetera magazine, you will have seen our article giving full details of the festival, and our website is getting regular hits from people trying to find out more information. 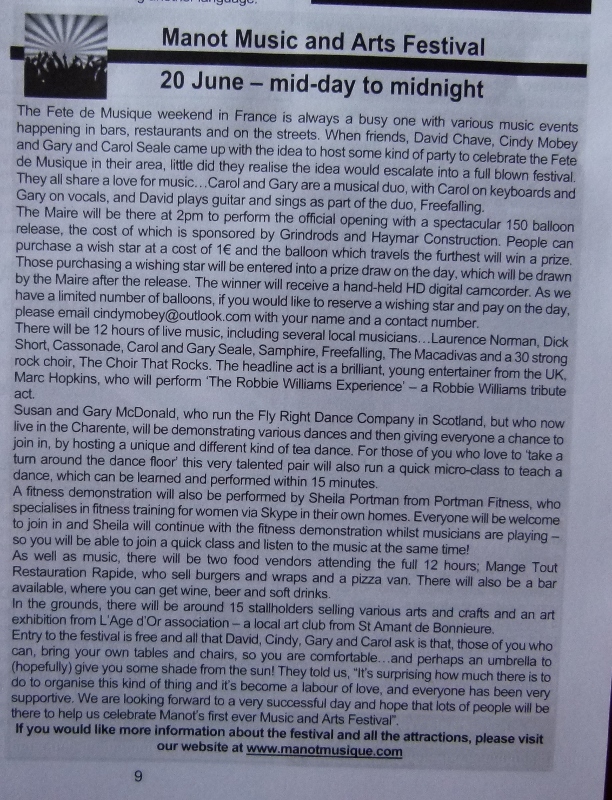 The website gives details of all musicians, stallholders, tea dance, fitness session and other activities, as well as information about the bar and food vendors. We will be publishing the itinerary, so you can find out the timings of when each musician will be on stage and when other activities will take place, within the next few days. www.manotmusique.com also gives details of camping at the festival site and a nearby campsite, as well as a couple of Chambre d’Hotes. We have been busy putting up posters in the area and some of you may have received a flyer by hand, or seen them in various shops. A short article will appear in the Charente Libre a couple of days before the event and if you are reading this, you must have seen the extensive online advertising on Facebook. We would be very grateful if you could share our articles and share the website with your friends and family. 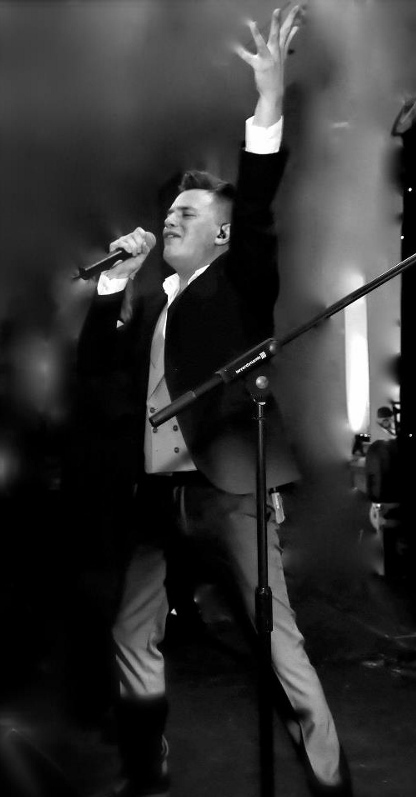 We are hoping that this…the first festival held in Manot (16500), will be a big success, and with your help, we’re sure we will have a fantastic crowd, for what is shaping up to be a brilliant event, with a ‘wow-factor’ ending featuring The Robbie Williams Experience.